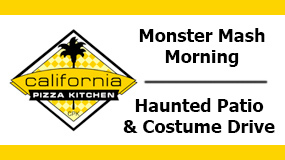 Come dressed up and enjoy a morning of crafts, music, games AND breakfast with notorious villains and friendly monsters. Meet Portland’s own Maleficent & The Evil Queen, Darth Vadar & Dracula, Frankenstein & Big Foot and more! Plus, take home a pumpkin, compliments of Bauman’s Harvest Festival. We encourage all families to bring a NEW* child’s costume to donate on-site to Chelsea’s Closet and receive a FREE GIFT! Tickets $5 each ages 2 & up. Pre-registration required. Limited availability. Available for purchase at Concierge Services; while supplies last. 100% proceeds benefit Chelsea’s Closet. This month, donate a NEW, unworn costume to benefit children in the hospital on behalf of Chelsea Hicks Foundation. For some children, Halloween is more spooky than it should be, as they fight life threatening illnesses and battle evil forces against them. This year, you can give a child the power to conquer their fears and make Halloween fun by donating a new costume at the costume collection drive October 11-31. We are only able to accept new, unworn merchandise, as items will be delivered to children in the hospital on behalf of the Chelsea Hicks Foundation. each month, with a permanent “closet” at Randall. *PLEASE NOTE: Due to infectious disease restrictions at the hospitals only NEW costumes and accessories can be accepted.